A top-10 chase day!! We left Abilene at about 9:30 with the intent of targeting storms at a triple point set up on the Texas Panhandle. Our target for the day was Canadian, TX as the earlier model runs which had favored Kansas backed off that play significantly and favored the Texas Panhandle. We made good time and, after a quick lunch stop in Childress, were in Canadian by about 2 PM with nothing to do but wait, so we hung out at the Dairy Queen. I had a fun talk with an Italian storm chasing tour group from Milan. At this point there were towers percolating on two distinct boundaries, one on the front just west of us and the other on the dry line, forming a triple point around Spearman. After about an hour of waiting, the HRRR predicted monster was in its early stages of development and we left to chase it, heading about 5 miles out of town on Rt. 83 and pulling off on a side road to watch the storm grow. Our vantage point was perfect and soon the storm had classic structure with a vertical updraft (though it later tilted over hard), inflow bands, and a flanking line. It wasn’t long before it developed a nice wall cloud and not long after that dropped an elephant trunk funnel more than half way to the ground! It seemed like for sure the storm was ready to tornado, but after cycling through two additional larger funnels more than half way to the ground, the wall cloud dissipated and as the storm was slowly moving east, we had to as well. It turns out that the funnel did indeed contact the ground (from our vantage we couldn’t tell), tornado #1 for the day! But why is it that when you are in a perfect spot in terms of visibility, contrast, and everything else, they never put down a nice long tornado!!? We headed back towards Canadian, stopping once more to view the storm as it cycled and generated a new wall cloud. The storm was barely moving, slowly drifting east, and was already becoming HP, so we had to see into the inflow notch to tell what was going on. We went northeast out of town on Rt. 60 and started experiencing significant amounts of chaser convergence, as well as a lot of other trucks that were stopped waiting for the storm to clear past the road which, as it turns out, took hours. We stopped and watched as the storm developed a lowering on the nose of the updraft in typical HP fashion and decided to head north to look into the notch. We weaved through heavy traffic and drove right up to the storm with the mesocyclone just a little in front of us and wild motion almost directly above the vans! Soon the meso was spinning away wildly just to our northeast and we got blasted by heavy RFD winds. We went even further north past the meso on the end of the hook to FM1920 where we watched another larger meso to our southwest move by. It looked like it could tornado right there, and the action was intense as we were pinned up against the front flank core by the meso, and once hail started falling we moved along with the meso to stay just ahead of the hail. As we did, the rotation to the right of the vans got stronger and stronger and soon a large cone shaped funnel lowered and contacted the ground. Tornado #2! This one was a big cone tornado at first heading straight at us about a mile away, then moving southeast, paralleling our direction as the storm dive bombed southeast, then later headed away from us as it curved around the meso. The cone grew in size and started to show a decent debris fan. One cool feature at this time was that you could look right up the clear slot and see up the whole updraft to the top of the storm. The tornado continued to intensify and grown into a larger cone until, after about 10 minutes the tornado roped out and that meso occluded, but no sooner had that happened then the next meso formed on the other side of the road from us and came towards us. We beat feet to get out of the way and stay ahead of the storm. We traveled about a mile to get ahead of the new meso and watched as it crossed the road behind us, all the while throwing out funnels part of the way to the ground. We continued on south of the town, parking near a small airport. The storm began to look a little strung out, but still had wild motion under multiple lowerings as each took turns being the focus of attention. Soon to our west, the storm generated another tornado, this one an elephant trunk that turned into a multiple vortex, #3, then another multi-vortex which lasted a bit longer and looked almost stationary before getting swallowed by the rain core.. #4!! All the while the town’s tornado sirens were blaring. Right after the 4th tornado, the storm belched out the strong, cold winds of outflow and a big precipitation core opened up under the updraft. The show was over for this storm. After an Allsups break in Pampa, we proceeded towards Amarillo, intending to jump south towards Claude and another storm south of there in the Caprock Country but it was barely moving in the slow upper level winds: Unfortunately there was no road to get south on it, and even if we could, the roads in the canyons were slim and at the bottom of the valleys which made it hard to see anything. So we decided we couldn’t make it and gave up for the night, heading into town for dinner at the Big Texas steakhouse. The night wasn’t quite done with us though as storms kept firing on the pinch point of a pair of boundaries south of town where our Claude storm had been, giving us quite a lightening show at the hotel. What a great chase day! We only moved a total of about 10 miles over the course of the entire chase. Even an hour after we drove away from it, the Canadian storm, which was right over the town, was dumping water and hail amounting to over 4” of rainfall and causing flash flooding. Mileage for the day was 399 miles. Passing through Shamrock, TX and by the old 50's style Conoco station. Storm towers going up near Canadian with the ubiquitous Allsups in the foreground. Pileus cloud forming over the explosive convection. In no time we were northwest of town as the front flank core opened up, several developing inflow bands are visible. The storm quickly matured and took on supercell characteristics. And just like that, first funnel of the day. This made it about 2/3 of the way to the ground. First funnel roping out. 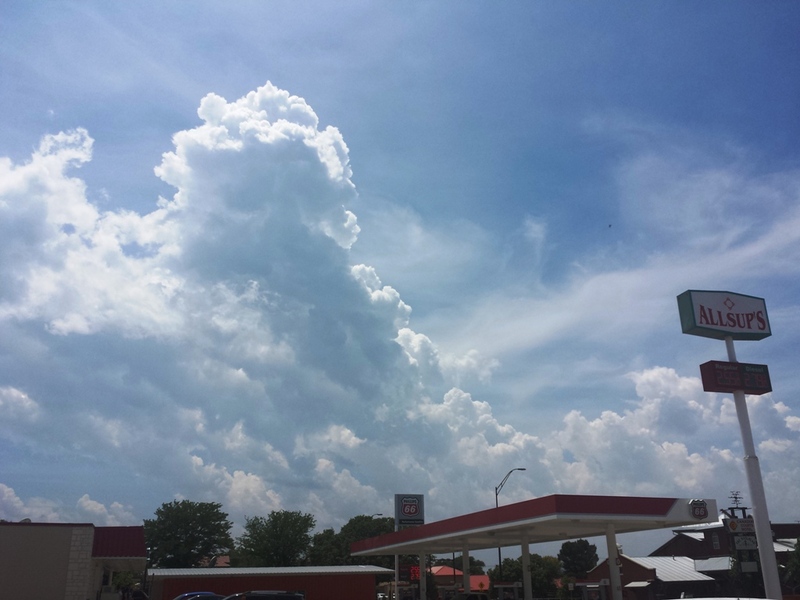 The storm looked like it was struggling here, updraft looking scrawny. But, the storm quickly recovered, with a new wall cloud developing. Violently rotating wall cloud and a second funnel forming. Funnel progressing. A touchdown with this funnel was confirmed, first tornado of the day! And once again the lightning picked up rapidly. Larger view of the storm during this phase. 2nd funnel roping out. Classic supercell structure! The storm moving off, now about due north of us. We repositioned northeast of town as the storm cycled back up. Big core passing across the road north of us. As the storm rapidly re-intensified, we charged towards the mesocylcone! As we stopped again, a cinnamon swirl of rotation right above us! Storm passing just ahead of us as we got pummeled by rear-flank downdraft winds. Raggedy wall cloud passing by. When storm chasers disagree on the chase target!! New wall cloud rotating rapidly. Crazy rotation in the wall cloud as it passed just south of us. We were now sandwiched between the wall cloud and the front flank core. Funnel forming almost right above us! A little farther down the road now, cone tornado funnel forming! You could look straight up the clear slot into the top of the updraft! Wider view. Tornado! Heading straight for us from the south. Fully condensed to the ground now. The next several shots follow through the cycle of the tornado. While this still makes it look like a satellite tornado is forming, it was really just a big piece of scud wrapped into the rotation. Broad view of the storm. The tornado closing in and almost taking wedge form. Ok, we'll call it a wedge right now! The tornado at it's closest. As it turned around the meso it began to drift away right around now. The tornado making it's way around the meso and starting to move away. 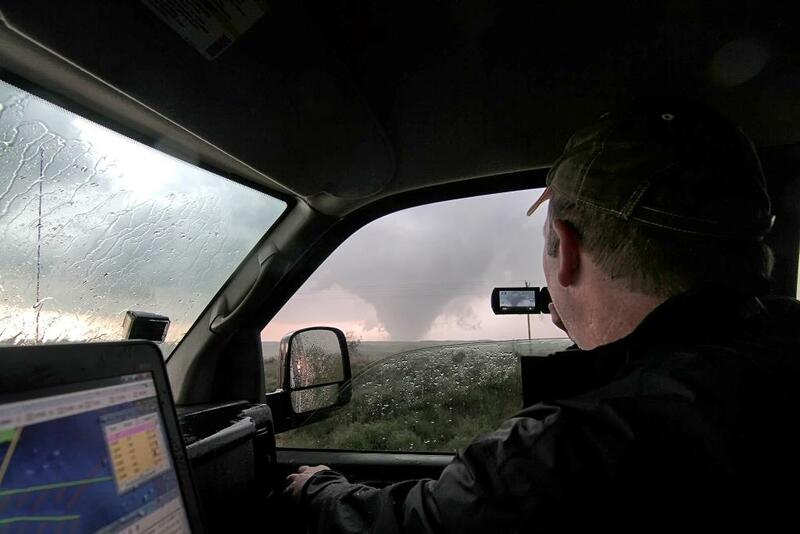 Filming the tornado, photo by Ryan Shephard, thanks Ryan! At it's widest. Drifting away from us now. Almost seems like it's disconnecting from the storm. Rope out phase. Still solidly in contact with the ground. The obligatory picture of Bill with a tornado, holding a picture of Bill with a tornado, holding a picture of Bill with.... Watch as I spin this tornado on my hand! Just about gone. Already we were concerned that the meso had jumped and a new tornado was ready to form just northeast of us! Packing up as the new mesocylone passes just behind us. 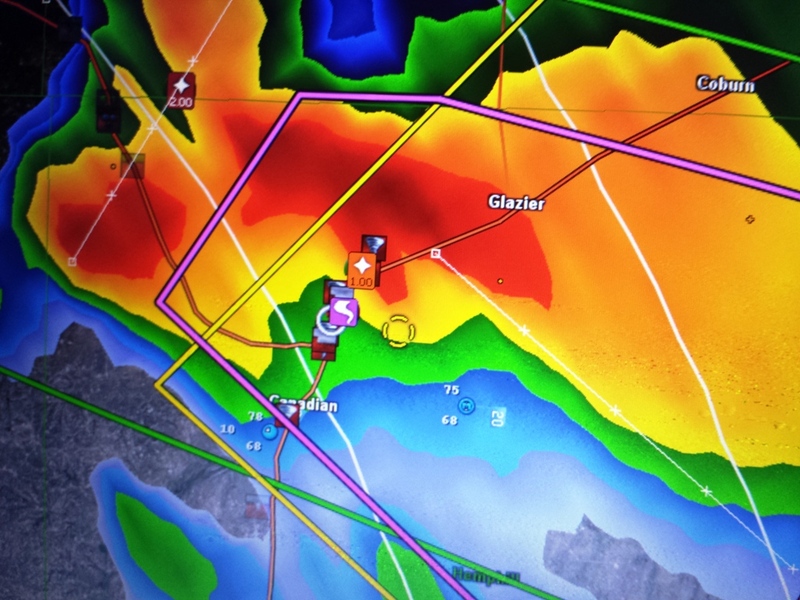 Note that this time the reported tornado was right on top of us, and the new area of rotation is just off to our east. Repositioned now with the new wall cloud to our north. The action area now to our west, with a nice CG bolt. Looking mean and spinning like crazy! ..and tornado number 3 of the day forms! Funnel all the way to the ground. Suction vortex trailing off the main funnel. Another funnel emerges from the mesocyclone as the storm moves north. The next mesocyclone forms over the Hemphill County Airport. And tornado #4 forms as the town's tornado sirens start to blare. Lightning illuminates the tornado. Wider view of the storm structure. Tornado changes to multi-vortex.